The dilute mutation takes its name from the affect the gene has on the coat colour of the animal. With the dilute gene the coat of the animal takes on a 'washed out' appearance, this is due to the failure of melanin containing vesicles being transported into the growing hair. The dilute gene is known to affect pigment transportation and also its deposition. This mutant gene is known in scientific literature as Myosin-5ad and is a mutation of the protein Myosin 5. This mutation that is known to affect melanosome transport also causes clumping of the pigment granules, which then gives the coat colour its diluted look. A similar mutant gene was discovered amongst a laboratory population of Grey agouti gerbils at Osnabrueck University at the end of 1997. 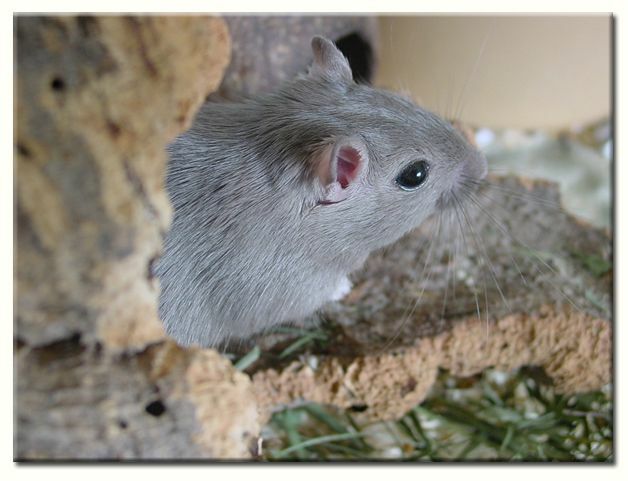 The GGG (Gerbil Genetics Group) has conducted several breeding studies on existing coat colours with this, the latest coat colour mutation in the gerbil. It is now believed to be the dilute (d) or Maltese dilution gene. Pigment particles or granules are synthesised in tiny vesicles called melanosomes. These melanosomes are then transported via the dendrites of the melanocyte to the shaft of growing hair. The melanosomes are carried by an actin dependent motor protein called Myosin5, this protein acts like tiny molecular feet and carries the melanosomes along actin filaments to the cells edge, Actin filaments are like little branching molecular ladders that are contained in the dendrites. Dendrites are the projections off the melanocyte. If this delicate pigment transportation system is affected, pigment transport towards the cells edge becomes abnormal. This is effectively what happens in dilute mutations or on this case a mutation in the myosin5 protein. Melanosomes containing pigment are effectively stuck in the centre of the cell unable to be transported to the cells edge. As a result, less pigment becomes incorporated in the hair, and when pigment is deposited it tends to be clumped in fewer, larger masses. Although mutations of myosin 5 affect pigment transport, it is responsible for many other functions, so other things can occur when myosin 5 is impaired. (This effect is known as pleiotropy*) Myosin 5 is also used in the maintenance and correct function of cellular processes of the melanocytes and neurons, and homozygous "dd" animals have melanocytes with fewer and thinner dendritic processes. Myosin 5 is also responsible for dragging endoplasmic reticulum to the edges of Purkinje cells where it produces calcium fluxes. Purkinje cells are large, important neurons in the brain. When myosin5 mutates it effectively disrupts this process so that it can't drag endoplasmic reticulum to the cells edge, so these calcium fluxes are then disrupted. This in turn lessens the Purkinje cells excitability, which effectively causes neurological deficits. These deficits can be observed in some of the more severe dilute mutations. *Pleiotropy many genes affect more than one trait simultaneously; this is known as pleiotropy ('many effects'). The human equivalent of the dilute mutation (d) is found in Griscelli Prunieras syndromes, which is a rare autosomal recessive disease, of which there are three known types. Individuals with Griscelli type 1 have a mutation in myosin 5 and are characterised by partial albinism, silver blond hair discoloration, and neurological deficits, which are usually of a serious nature. The mutation of this protein in mice causes the dilute (d) coat colour. People affected by Griscelli type 2 syndrome have a mutation in another transport protein, called rab27a, and they have the symptoms of type 1 plus immunodeficiency. The mutation of this protein in mice gives rise to the Ashen (ash) coat colour. There is a third form of Griscelli syndrome (GS3), which is restricted to hypopigmentation. This is characterized by a silver-gray sheen to the hair and the presence of large clusters of pigment unevenly distributed in the hair shaft. This results from either a mutation in the gene that encodes melanophilin (Mlph). (a mutation of this protein gives rise to the leaden (ln) coat colour in mice) or an identical phenotype in mice can result from the deletion of the MYO5A F-exon. The melanocytes of people with Griscelli syndromes have short, stubby dendrites, which contain mature melanosomes. This indicates a transfer block towards the surrounding keratinocytes. The blue coat in mice is an old established colour variety in the mouse fancy. After speaking to breeders, the only health problem that has been mentioned to me regarding blue coloured mice has been a slight increase in respiratory infections, and by and large it is generally regarded as a healthy coat colour variety. Mutations at the d locus in mice are particular interesting to scientific research, not only because of their diluting effect on hair, but because they can also affect the nervous system. Over the years with mouse research many other dilute mutations have appeared, some being much more severe in their effects, causing severe neurological defects including ataxia, seizures, and even death when the mutant gene is in the homozygous state. These genes include dilute lethal which is a mutation that is recessive to both D, and d, although phenotypically it is indistinguishable from dd. This gene produces a severe neuromuscular disorder that is characterised by convulsions and condition known as opisthotonus, which is the arching upwards of the head and tail. Some other extreme examples that have been studied are, Slight dilution (d S), and dilution15 (d 15). Both of these genes affect the nervous system. Slight dilution mice in the homozygous state gives rise to a coat colour that is darker than dd, but also causes abnormal behaviour at approx 4 months of age that tends to be more pronounced in females. The animals sway, lean, and arch their back. They quickly lose their balance as if their feet are unable to support their bodyweight. However, surprisingly these characteristics do not affect fertility or shorten the lifespan. The d15 mutation also dilutes the coat when homozygous and also has behavioural abnormalities that are similar but less severe than dilute lethal (dl ). In rats there are two main blue varieties, these are known in the UK as English blue and Russian blue. In Europe there is also a claim of a third blue variety known as German blue, and in America there is a new blue being called Midnight blue. There has also been talk of the Leaden gene amongst rat fanciers in the past, which will also give rise to a blue shaded animal. The origins of the English blue rat began in the summer of 1990 in a pet shop where three miss-marked blue hooded pups were discovered. The blue produced by this gene is an especially vibrant and intense shade of blue, quite different from the blue shade observed on other domestic species, which are usually a slate blue-grey in shade. Roy Robinson, breeder, and famous geneticist considered these blues to be caused by the dilute (dd) gene, and as a result genetic notation in the UK follows his example. This blue gene is genetically identical to the American blue rat coat colour, although the US refers to it as being aagg. This identical gene was discovered in the same year as the English blue, and coincidentally also in a pet shop. Also in Australia in 2001, a similar gene was discovered that looks and acts very similar in nature to the English blue. There are other shades of blue recognised in fancies, such as slate, sky, or powder blue, but test mating seem to prove that the same gene is still producing these colours. The different shades are said to be caused either by modifying genes or different alleles of the same locus, also other recessive genes maybe influencing the final shade. Both this gene, and the gene that produces the Russian blue coat colour behaves similar to the dilute gene in gerbils as it is more effective at reducing colour intensity in black pigments. The English blue coat colour is the variety that is often attached to adverse health issues in many rat fancies around the world. The Russian Blue Rat. was named after the similarly blue coloured cat. This coat variety was discovered in 1993 in the USA and was imported into the UK in the year 2000 from Europe. It looks very similar to the shade of blue seen in other species, which is a dark blue slate grey, like pewter, with a slightly heathered look due to pigments clumping in the hair shaft. It is said to be a different gene than the English blue (dd) but hasn't been scientifically studied, so amateur breeders in the UK use rb in genetic notation for this coat colour, mainly to avoid confusion between this blue variety and a dd blue. What does adds to the confusion is American and some European breeders assign the dilute (dd) gene to the Russian blue coat variety! It behaves like a simple recessive gene and looks and behaves in a similar way as the above (dd) gene, but is much less variable in shades. When side-by-side, the Russian and the English blue coats are distinct colours and easy to identify from one another, however if you test mate a Russian blue carrying no recessive genes to a English blue with no recessive genes, only black pups appear in litters. The German Blue rat, is also known as graphite, and physically it looks very similar to Russian blue. This is a dark slate-blue grey with ticking all up and down the hair shaft caused by the pigment granules clumping. This effect is similar but not the same type of ticking you can see in the Russian blue, which is limited to the end of the hair shafts, some being dark, others light. Again this looks and behaves very much like dd in other species. However test crosses with German blue and Russian Blue give all black babies, and no blues are produced. This has only been recently recorded in the USA. It is a deep, dark blue, darker than the Russian blue colour in rats, and slightly lighter than slate in gerbils. There is no heathering look to the colour as the pigment does not clump in the hair shafts. I feel this particular gene may be totally separate from the other three blue varieties because of the absence of pigment clumping in the hair shaft, and may be a totally different form of dilution gene. Several different countries rat societies have reported a range of health problems in their blue (English blue "dd" ) rat populations. It was noticed in one country that more frequently than any other coat colour variety that blue rats suffered from a variety of serious health conditions. It was noted by breeders that they often have conception and birthing difficulties, die prematurely, and die due to causes other than old age. The report discusses 'Blue rat toxicity' which is the danger of the genes of blue coloured rats contaminating the genes of other coat colour varieties of rats. It also highlighted that breeding blue coloured rats with other coloured rats may diminish the expression of symptoms in their progeny but it will not affect transmission of these health problems. Other coloured progeny of blue coloured rats will still carry the genetic coding for these various syndromes. The conclusion was that the breeding of other coloured progeny of blue coloured rats from the present gene pools would result in other coloured rats suffering ill health, breeding poorly, and dying prematurely. Their conclusions roundly condemn this blue rat coat variety and several measures are intended to discourage the breeding of blue or any colour carrying blue in its genetic history. "...recommend breeding from a doe which is carrying the blue gene instead to avoid these complications. If it is necessary to breed from a blue doe I would follow these guidelines, choose a doe between the age of 4 to 6 months, only allow her to have one litter and if you experience problems during this first pregnancy do not mate her for a second attempt"
"They often miscarry or fail to go successfully into labour, sometimes with disastrous results. I would recommend breeding from a doe which is carrying the blue gene instead to avoid these complications"
"..One other thing to be aware of when breeding Blues is their predisposition to skin problems. Some seem to be particularly sensitive to even small amounts of fat/protein in their diet, and they end up with really bad scabs. No Blue that has problems with scabs should be used in a breeding program as it will pass this problem on to its offspring"
"Our original stock of Blues had no particular temperament problems, and were well-adjusted, healthy animals. In the last year however, I have heard an increasing number of accounts of Blue rats with major health problems from people who bought them in pet shops. I have also heard several accounts of animals so aggressive they had to be put down"
The nature of the wide spectrum of health problems found in Australia's Blue rats and also similar health problems seen in the UK and US rats has been tentatively explained by a hypothesis that this may not be the dilute "dd" gene at all but a gene mutation that causes disorders in lysosome-related organelles. These disorders are caused by various mutations in different genes that affect the development and function of certain lysosome related organelles that lie within cells which give rise to individuals with dilute pigmentation, depressed immune function (respiratory and skin infections) and blood clotting disorders. Human anologues of these genes can be found in Chediak-Higashi syndrome and also Hermansky-Pudlack syndrome. In rodent lab populations there exists several mutations that causes these disorders and are homologous to Chediak-Higashi and Hermansky-Pudlack syndrome in humans. In mice Chediak-Higashi syndrome mutants are known as "beige", and on a non-agouti background the mice display a charcoal grey fur. There are also many forms of Hermansky-Pudlack mutations in mice, but all affect the development of lysosome-related organelles. The shade and amount of dilution in their fur can vary greatly and is also hinged upon the background coat colour genes. It is interesting to note that in lab rat populations the homologous mutation to Chediak- Higashi syndrome in humans appeared in a colony maintained at Hamamatsu University School of Medicine, but the actual colony had originated from the Australian National Institute of Genetics. The mutation is also named "beige" after the similar mutation in mice. Although authors* are unsure if the dilute gene in dogs is the same gene that causes dilutes in mice, a common disorder IS associated with blue and diluted dogs. This is known as Colour Dilution Alopecia (CDA). This condition went under many names in the past, such as Blue Balding Syndrome, Blue Doberman Syndrome, Colour Mutant Alopecia, Congenital Alopecia, etc. The References to Doberman Pinschers or blue hair coats arose because the condition is very common in blue dogs of this breed, but it is not limited to either blue dogs or Dobermans. Nowadays the condition can affect any dilute-pigmented dog, regardless of coat colour. CDA has been recognized in dilute individuals of many breeds of dogs including Chow Chows, Dachshunds, Doberman Pinschers, Great Danes, Irish Setters, Italian Greyhounds, Standard Poodles, Salukis, Whippets, and Yorkshire Terriers. In Russian Campbell dwarf hamsters there exists a similar diluting mutation where the normal colour is diluted to a light grey, the colour is known as Opal. Although its heredity hasn't been published yet, it is thought by breeding results to be the common diluting gene from other species, known as dilute (d) The coat colour is now quite well established. In 1994 it was imported from the USA to the Netherlands. There have been several reports that the Opal mutation in Europe wasn't the true mutation that occurred in pure Campbells dwarfs, but instead were feared to be hybridised Sapphire Winter Whites, and it is true that there have been a prevalence of hybrids floating around Europe. However the true origin of the Opal mutation was in the lab animals of Dr. Katherine E. Wynne-Edwards, a Professor of Biology and hamster behaviourist at Queen's University in Ontario, Canada. The mutation occurred in a colony of captive bred, but wild caught Campbells hamsters. In the USA today there are still many pure Opals, and breeders have never noticed health problems associated with this mutation. Even when Opal breeding began over a decade ago, breeders detected no health problems. The animals were of a good size and of good health and bred as readily as the Normal colour types of that time. The main problem that breeders face with "dd" breeding in Campbells, is a gene combination which will also mask the ruby eyed mottled* gene in Campbells hamsters. It is known that some colours can mask other colours or patterns. A common example of this is Albino Campbells. The Albino lacks all pigment. So, if one parent of the Albino was a Mottled but carried Albino while the other parent was an Albino, you would expect to get some babies who appeared to be Albino but were genetically also Mottled. This effectively means that you cannot positively identify which Albinos were also Mottled by appearance alone. Thus, you would never want to breed an Albino from one of these litters to a Mottled as you would really be breeding a Mottled to a Mottled. As a result of this cross you can expect 25% of the babies to be eyeless, toothless whites who would die prematurely. So any pairings that create such a situation should be avoided. Another one of these gene combinations is the Dilute Platinum, which in most cases creates an entirely white hamster which will mask the Mottled gene. Therefore it is deemed very risky and unethical by breeders, to combine Platinum with the lethal Mottled gene. If Dilute Platinums appear, you need to treat them exactly as you would treat albino Campbells, i.e. never breed them to a Mottled and warn all potential owners/breeders of the situation. *Genetically in Campbells hamsters the two Mottled genes are represented by the symbols Mo and Mi. Both genes were found in 1991 in the UK, and both genes are also dominant and give the same outward appearance. At present the Mo gene isn't available in the USA. This gene is the much safer non-lethal Mottled gene. The other gene, Mi, is the lethal Mottled gene and is also referred to as the Ruby-eyed Mottled Gene. This gene when bred correctly and responsibly produces healthy babies. When bred irresponsibly or through ignorance, deaths and physical deformities will arise as it is regarded as a lethal gene when homozygous. So in a double dose, this gene will produce a baby which is believed to be eyeless and toothless. Such babies will be snow white, will be smaller in size than its normal siblings, and will typically die at the age of 2-3 weeks. The Ruby-eyed Mottled gene in Campbells does not necessarily produce hamsters that have red/ruby eyes. You can have a Ruby-eyed Mottled Black hamster, and it will appear to have black eyes. The eyes will only appear ruby or red coloured when a light (torch) is shined on them. The dilute coat is well known in cat varieties and produces an array of wonderful colours with no health problems. In cats however there is very little known about the precise spelling of the DNA that encodes coat colour genes. However as mentioned above with mice who's DNA has been extensively studied, and their DNA sequences have been determined, we can glean ideas, and make certain assumptions about the similar dilute gene in cats. Over the decades many mutations have occurred in different regions of the mouse dilute gene, and these mutations result in the dark coat colour of normal mice being diluted into coat shades that vary from medium to light in colour. As mentioned some of these different versions of the mouse dilute gene produce a range of neurological impairments. Overall, the findings in mice suggest that at the DNA level some cat breeds or breeding lines, may have a slightly different spelling in the DNA sequence of their dilute gene. Moreover the mouse studies imply that altered forms of the feline dilute gene may also be responsible for some of the subtle variations that can be observed in individual cats displaying one of the recognised dilute colours. In Gerbils this dilute gene seems quite variable in its effects. It has been noticed that when on a non-agouti (aa) background, the shades of blue can be quite wide ranging. This also seems to be the case on an agouti background. See Shades of Blue and Shades of Gold galleries on e-gerbils coat colour reference guides for more info and examples of these coat colout variations . Also a Golden agouti gerbil does not look as brown as an agouti mouse or an agouti rat. The wild-type gerbil is much more golden, so dilute mutations will tend to look much more yellow. In some other animal species, the dilute gene dilutes all colours equally. This is basically because the dilute mutation doesn't affect colour production; it affects the pigment granules shape making them larger with a more defined, sharper edge. This means it absorbs far less light. In mice, the dilute (d) or Maltese dilution gene as it is also known reduces pigment intensity in black, brown, and yellow pigments equally, this then gives their coats that 'washed out' look. This doesn't appear to be the case with the present dilute gene that has been discovered in gerbils. Breeders have noticed, as have the GGG (Gerbil Genetics Group) that yellow colours do not seem to be lessened in colour intensity as effectively as the black based colours are. Argente Golden and most of the very yellow colours don't seem to be affected much by this dilution gene, as it seems far more effective at clumping black pigment granules. It has also been noticed by several breeders that the gene seems to intensify or increase the amount of white markings of spotted varieties when it is present in the gerbil's genetic make-up. Of course there exists patched "dd" gerbils, and mottled "DD" gerbils, but something definitely seems to be happening when "Sp" and "dd" are combined. This maybe because of the diluting effect of the gene on white markings, and also that it clumps more of the white markings together, or could even be because the D locus and 'mottled' modifiers maybe near each other and some sort of coupling is involved, similar to that seen with the C locus and p locus. The most common observation that breeders have noticed with blue gerbils is that they seem to suffer from low fertility. In the UK "dd" type gerbils have proved quite difficult to breed. The gerbils themselves tend to be smaller sized, and often pairs haven't bred at all. Initial breeding with the first generations of the first dilute gerbils showed that mothers tended to have problems in childbirth, not only did the pups often die, but also the mothers often died. These health problems were blamed on too much inbreeding at the University that they came from, this may have been a contributing factor, but it's far more likely the cause was also due to the nature of the dilute mutation itself. These initial health problems were said to be reduced or bred out by the GGG before they were released to the gerbil community in general. It was also noted that these first blue gerbils died prematurely, sometimes under a year, again this trait seems to have been bred out by outcrossing the initial breeding lines. Also there has been other anecdotal evidence of some European lines being predisposed to seizures. At present the N.G.S. recognises only one new dd colour and that is the Blue coated variety, and currently this colour only has a provisional standard. Although the dilute gene dilutes all the existing coat varieties, only 6 colours are being regarded as new by breeders. The rest of the coat colours produced look far too similar to existing colours to be regarded as new coat varieties. In countries like Germany and Holland dd gerbils have been bred extensively, and although "dd" lines have been initially strengthened, they have posed a potential, and in some cases real threat to other established colours, because of their diluting effect on the existing colours and on some occasions, associated health problems. It has been said by European breeders that the health issues regarding childbirth, sudden death and high mortality rates have been "bred out" by outcrossing. My biggest fear about this is that the nature of the "dd" gene in many cases comes with health problems, and outcrosses to other healthier colours could be masking some of these deleterious effects that existed in the original populations. They could just as easily turn up in other diluted gerbils a few generations down the line. This seems to have been the case with the dilute gene in blue dogs, and was one of the major fears of the Australian rat fancy with their blue rat population. Another point to consider is that the average breeders rodentry could have their colour lines completely ruined if this gene was inadvertently or accidentally bred onto their existing stock. A breeder can easily purchase an apparently "normal" coloured gerbil, only to find out months later, that it's a carrier of the dilute gene, spoiling months or years of breeding work. A recessive gene can be easily bred into a population but can take a great amount of time, effort, and available tank space to breed it out. No other gerbil mutation has risen in popularity quite as fast as this, and as a consequence the gene has been indiscriminately spread through many European countries. In the UK this hasn't really been the case. Most of the initial blue gerbils that we received seemed very inbred. Add to this a low fertility rate, poor type, and a base population of fewer than ten gerbils, and you hardly have the recipe for success! Personally I would advise all potential UK breeders to breed this mutation with care and caution, stick to one or two complimentary colours to cross it with, and discontinue any breeding lines where health issues have been noted. For breeders who don't have an extensive grasp of applied genetics, or new breeders who don't really understand genetics, the end results could be quite devastating if a sensible breeding programme isn't undertaken with the dilute gene. If you do decide to breed with this gene as mentioned above just use one or two colours to outcross it to, i.e. black, slate, or lilac, (bearing in mind that the gene seems to be far more effective at clumping black pigments) or Gold or Grey agouti, and set up a few breeding lines so that you are not forced into a position of inbreeding once again with the f1 offspring carrying the "d" mutation recessively. Your other option is if you wish to try the dilute gene on collared or mottled varieties, to try to increase the white markings. Here you would have to be cautious as the gene itself plus the "sp" gene could dilute the existing colours far too much making them blurred and insipid. There is the option of working solely on producing the collared or mottled in blue, as the shade can look very nice when bred correctly. Try to pick the darkest of the blues in this case, so that the diluting effect doesn't look excessive on the final coat colour. Always outcross wherever possible to large, healthy gerbils of good type and temperament. To do this correctly will take up a lot of tank space, which is another point to consider if you have other breeding lines you are currently working with. The UK gerbil fancy should be guided by other animal fancies experiences with the dilute gene,taking note of it's plus points, their breeding methods with "dd" and its potential for causing health problems in other popular pet livestock. We can also learn a great deal from European Gerbil breeders, and from the past and present breeding problems they have encountered while breeding dilute gerbils with their existing stock.